Introducing FWstudios — a brand new, purpose-built film production space in Bow, East London. Fully-rigged, air-conditioned and sound-proofed, with separate client area, makeup and shower rooms, our versatile 38sqm studio is ready for any scenario. FWstudios is just five minutes walk from Pudding Mill Lane DLR and 15 minutes drive from Canary Wharf. There's ample parking nearby, with easy access into the space itself. 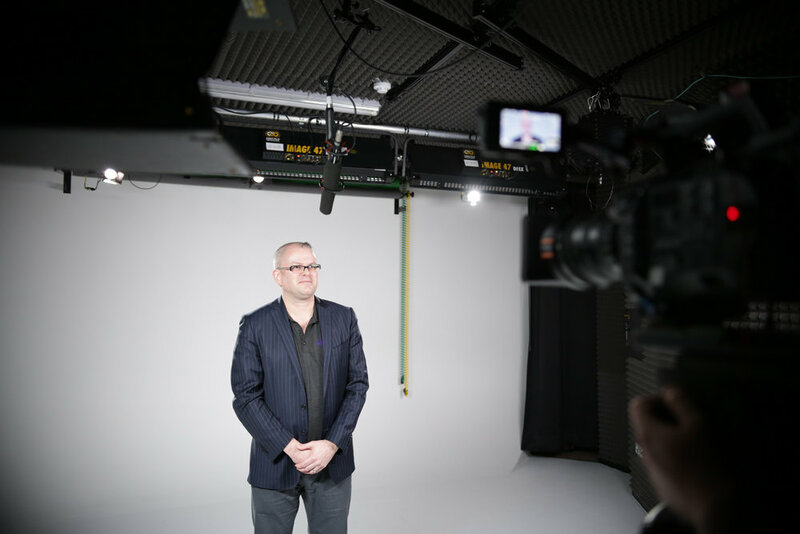 The studio comprises a white cyclorama, black curtain, background rolls including chroma green and mid-grey, a versatile lighting rail system, 100mb asynchronous internet, multiple camera positions and more. Further state-of-the-art equipment is available for rental, ensuring your time here at FWstudios is as productive as possible. Our green room can accommodate both clients and contributors in air-conditioned comfort, with sofas, refreshments and a bathroom. A dedicated makeup room with production lighting and a separate shower complete the facility. Our competitive rates include technical setup to ensure everything is tailored perfectly for your shoot, and we have experienced and dedicated production crew on hand for hire if needed. Talk to us today about your requirements - we'll work with you to make it happen! ... or send us an enquiry using this form.